It's the first of the month and you know what that means... It's freebie time! The Pixel Scrapper blog train theme this month is LOVE! Of course it's Valentines in just a bit but for some odd reason I really struggled with this one. It's not that I haven't made love kits before so I'm thinking it might have been the color scheme that got to me. We are in the middle of winter. The ground is covered with snow and it is freezing out there. So while I don't really feel this kit is anything special, it is just by being finished something quite special. This is the second month I'm doing the blog train and when I was uploading this kit I saw that the last kit was downloaded more than 600 times. If just a tenth of these actually end up using the kit I'm ready to call it a success. And if anyone of you are returning this month and have used the Take Flight kit, please leave a link to your layout in the comments so I can leave it some love. 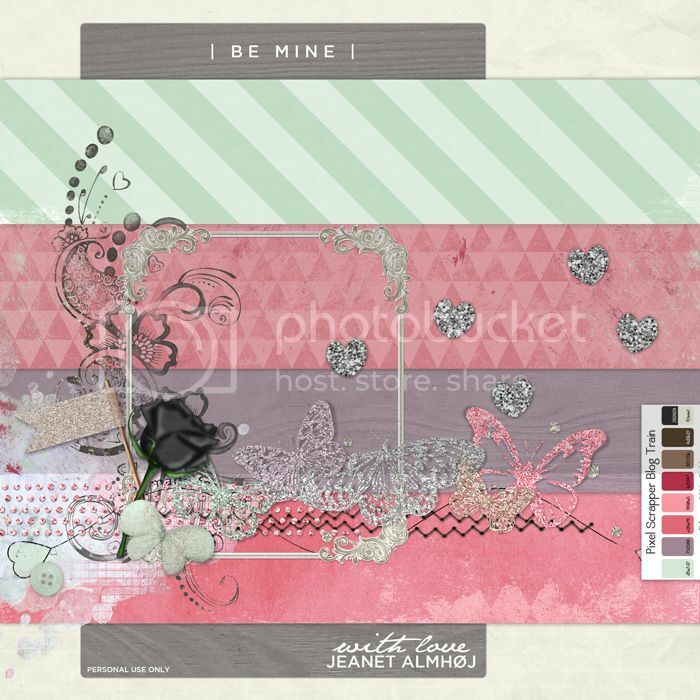 Oh and if you are in the market for more romantic kits don't forget to check out my New Beginnings kit. I'm sure it'll work great with this new one. Thank you for the pretty kit. I love the glitter! I think I am a fan now!! Love all your designs. Thanks for sharing. Thanks for the kit, pretty stamp. Jeanet, I think you are such a talent and your gifts are great! I've seen lots of your layouts at TLP and I'm always so impressed. I'm so glad you found us over at Pixel Scrapperas well! Thank you so much! Thank you for the glitter & shine..love it! Such a sweet kit! Thanks for sharing! Gorgeous butterflies and the rest of the kit is also stunning! Thank you. Love the bling and the butterflies. Heartfelt thanks.